When the Shiv Sena, in the aftermath of the Elphinstone Railway Road tragedy, said, “You [the NDA government at the Centre] have money for bullet trains, but not for repairing the bridge. You let the poor passengers die…and for moneyed passengers, you talk about bullet trains,” we couldn’t agree with them more. A few weeks back, supporters of the current government, took to the streets and internet to applaud the project of bullet train. Just like they did, when they said demonetisation would benefit the poor and GST would improve taxation systems in the country. 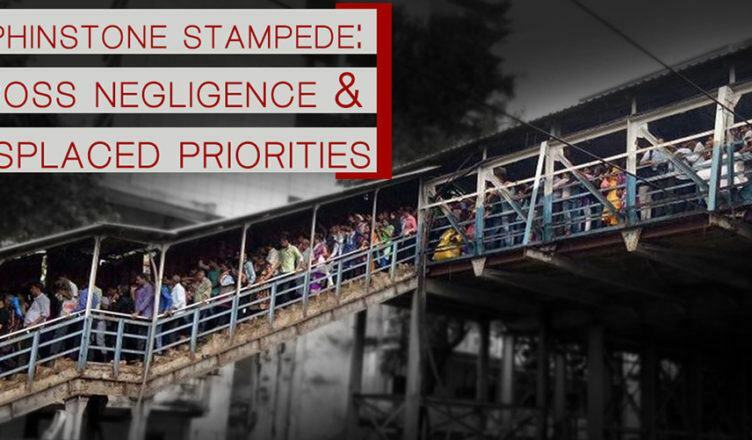 The timing of the Elphinstone tragedy issues an alarming and grim reminder of the state of railway mismanagement and lack of priority towards passengers’ safety. During Suresh Prabhu’s stewardship that commenced in 2015, the Indian railways witnessed a staggering 346 accidents which resulted in the deaths of at least 277 individuals. To take the issue of derailments alone, a systemic problem that plagues the railway grid. Between 2016-17, an IndiaSpend analysis of Parliament data has shown that railway accidents from the same resulted in the highest death toll (193) in nearly a decade. And yet, by the end of Suresh Prabhu’s disappointing tenure, nearly 1.42 lakh vacancies for the position of safety officers, who could oversee and ensure that due diligence is paid towards the safety of passengers, remained empty. The Indian Railways is one of the most inspiring yet complex projects undertaken anywhere in the world. Currently, taking a daily average, the operations transport nearly 23 million people a day, employs 1.3 million workers who work to ensure that the 19,000 trains that run each day are operational. But it is also a system that is plagued by severe infrastructure deficits, a poor safety record and the over utilisation of tracks. The Bullet Train project is expected to cost Rs. 1.10 lakh crores with Japan having promised a loan of 88,000 crores to India. But surely this money could have been better spent in improving the gaping structural problems that are today threatening to derail India’s railway grid as a whole.